The Old Spanish Trail has been called the most arduous and difficult trail in the United States. With Native American historical roots, the trail was used by the adventurous and opportunists bringing textiles from Santa Fe to trade for mules and horses in Los Angeles beginning in the early 1800s. Spanning more than 2500 miles, parts of the trail were used by fur trappers and later by railroad and military surveyors. 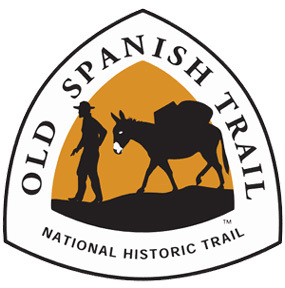 The Old Spanish Trail Association, its members, friends, and partners, are dedicated to protecting, interpreting, and promoting the Old Spanish National Historic Trail. The Old Spanish National Historic Trail was established by Congress in 2002. It has often been referred to as the most arduous, difficult trail in the United States. Its designated routes cover six states and some 2,700 miles, traversing mountains, deserts, rivers, and coastal valleys. It was historically used by curious and brave, enterprising, and sometimes nefarious men, forging trade routes between the Mexican cities of Santa Fe, New Mexico, and Los Angeles, California. New Mexican woolen goods were traded for California mules and horses, but the trade also included furs, hides, and even Indian slaves. The Crossing of the Grande, now called the Colorado River, a modern day look. Archaeology on the trail.Photo courtesy Jack Prichett. Visit his website here. San Gabriel Mission 1832 Painting by Ferdinand Deppe.